Given the new arisen interest in Vanguard armour, I thought I'd make a quick guide on it's construction and stats. And now we've covered the stats: We address the method. There are multiple components to create Vanguard! I will list them here. Additionally you will require 99 Crafting. These are obtained from Nomad as a drop, and from the RoTS minigame (::rots, speak to wise old man - [[insert rots guide link here]]). The process is simple, click the schematics and follow the dialogue accordingly. Although, all is not as easy it seems. There is a 20:100 chance when building a Vanguard piece that your Nex pieces will be lost. That being said, I wish you all the best of luck in creating your wonderful Vanguard armour. Now that it is untradeable, the chance to lose pieces should not exist. Solid post man, thanks! This will likely be useful for many players to come. I had a bit of trouble confusion making my vanguard when I had the pieces(or so I thought) to make it ready. 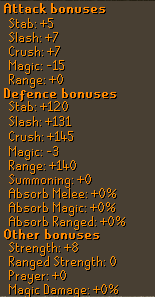 Plus adding in the stats so we can see the benefits of the armor beforehand, much appreciated Fucs!